Despite the increased usage and potential benefits of self-tracking technologies for pursuing healthy lifestyles, the relationship that users have with these personal devices has remained under-studied. The current paper presents a field study to explore the perceived role of self-tracking devices as social actors. Participants received a pedometer which they carried on their person for one day. Users’ access to numerical feedback and the feeling of being tracked were manipulated, and users were interviewed afterwards regarding their experiences and their perceived social relationship to the tracker. Results of a thematic analysis indicated that in general, the feeling of being tracked led to higher self-awareness regarding participants’ walking activity. In particular, having access to agent feedback gave rise to more frequent self-evaluative reports towards one’s performance as well as a closer relationship between the device and its user. 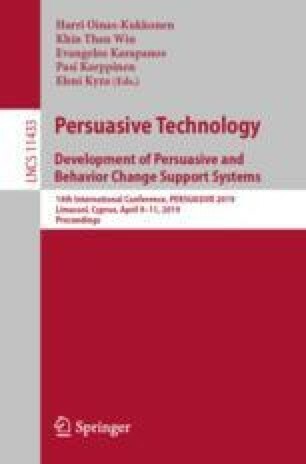 The results extend the CASA (Computers As Social Actors) paradigm by demonstrating that the capturing (and feeding back) of data can make a device be perceived as a social actor and be described in relational terms, even in the absence of clear social cues. We would like to thank Heleen Rutjes for her help as independent coder in order to assess inter-coder reliability. This work is part of the project “Mobile Support Systems for Behavior Change”, supported by Netherlands Organization for Scientific Research (NOW). For more information see http://behaviour-change.eu/.